Did you know it is estimated to cost £100-£150 million each year to investigate and clear up fly tipping in the UK. 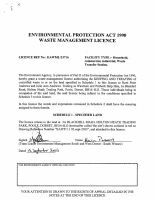 The Environmental Protection Act 1990 imposes Duty of Care on all waste producers, an essential part of the Duty of Care is the correct disposal route for your waste. At Wareham and Purbeck Skip Hire we are commited to operating in a responsible and substainable manner. Our Waste Management team have years of technical experience and can offer a un-precendented level of expertise in recycling and waste management solutions. As one of the most trusted and respected waste management company's in the area, we are dedicated to controlling your waste and it's environmental impact.